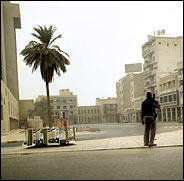 As security culture intensifies and cameras are installed and walls are built and our cities become slowly fortified – Baghdad, for instance, as Dexter Filkins writes in tomorrow’s *NYTimes*, “seems a city transported from the Middle Ages: a scattering of high-walled fortresses, each protected by a group of armed men. The area between the forts is a lawless no man’s land, menaced by bandits and brigands” – I’m left wondering if perhaps Belfast – yes, Belfast, though maybe Derry (once the most televised city on earth due to the incredible extent of its police CCTV network) – could someday serve as a predictive future history for cities like London and New York – or, for that matter, Baghdad. Machine-gun posts defined a real stockade. Of Stalag 17, a bad dream with no sound.